If we are entrapped in the ego as the prevalent experience of ourselves, but we want to experience the true self (sat naam), we need guidance and technologies. Action without any reward for the illusionary doer – the ego – will hurt and humble the ego and ultimately reveal the underlying timeless essence of our being. The ego – as a result of the universal phenomenon of “ahankaar” – automatically assumes its own and independent identity for any being in creation. It automatically collects and accumulates results of actions, personal history, energies of reputation, possessions, relations, mental and behavioural patterns and habits, to define and maintain borders and identity. In the course of its lifetime, it will do almost anything to protect itself. Since the ego is an illusionary and therefore transitory product, it has valid reason to fear death. The game of life consists in the challenge of how much we are ready, willing and able to put down the dear toy of ego and gain the priceless ecstasy of pure, true being, sat naam: To die the death of the ego while yet physically alive. It is written that only very few succeed in doing this, especially during this dark age of kaliyug, when the immediate and tangible temptations of the ego are growing infinitely louder than the sweet but faint and subtle long-distance call of the soul. Normally, the ego would automatically consume every reward or praise that is issued by anybody about our actions and turn it into satisfaction and identity. The blessing consists in circumstances which will prevent that from happening. This impossibility of claim will hurt the ego, because it is trained and accustomed to cash in the results of our actions immediately and expand on them its fame and false identity. More often than not, this actually is a major part of our motivation to do anything at all. True seva opportunity will therefore never feel convenient, and comes with some pain of the fire of purification. The true result and karma of our actions – if selfless or not – does not come from the outer action, but from the inner action, the motivation or intention. Sri Krishna in the Bhagavad Gita: “The wise see that there is (internal, karmic) action in the midst of (external) inaction and (internal, karmic) inaction in the midst of (external) action.” (4.18) Consequently, also for the effect of seva, we need to be more aware of our attitude and motivation than concerned with our outer actions and their apparent results. If seva is understood merely as “good deeds” in a moral sense, we might miss the point of this ancient technology. On the contrary, we might produce undesirable effects. Driven by motivation to improve a situation (which mostly doesn’t need our improvement, when seen from a much bigger perspective), or to improve ourselves, we produce pride in case of success and shame otherwise, which is the standard process of ego in action, the opposite of seva. In summary, Seva is an attitude of unconditional service in action which is performed without any expectation of personal gain, yet investing the best skills and spirit possible, offering the results of our efforts for a higher or even unknown purpose. In a culture which trains us to always expect a return for an investment, this is a radical proposition that moves us out of our usual mindset into a spirit of liberation from any illusion about ourselves. The idea is to challenge and ultimately resolve the bonds which tie us to the illusionary sense of who we are, the energies of our history, reputation, relations, possessions, pride and shame, and reach liberation from worldly entanglement, the aim of Yoga. Once Baba Sri Chand, the elder son of Guru Nanak, came to meet Guru Ramdas. Because of his advanced age compared to Guru Ramdas, Baba Sri Chand took the liberty to jokingly ask Guru Ramdas, “Why have you grown such a long beard?” Due to his strong yogic powers, Baba Sri Chand was said to have maintained the outer appearance of a 16-year-old throughout his whole life, without much facial hair. 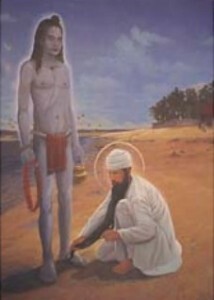 Guru Ramdas replied, “My Guru has told me to use this long beard to wipe the feet of great Saints like you.” And Guru Ramdas bowed down and started wiping Baba Sri Chand’s feet with his beard. Baba Sri Chand was moved by this spirit of true humility and seva and replied, “Your sweet humility is the magic that makes you so great.” And Baba Sri Chand bowed in return to Guru Ramdas. Baba Sri Chand enjoyed company and respect of all the Gurus from Guru Nanak to Guru Hargobind, during who’s reign he left this world at the age of ca 160 years. Both, Guru Amardas and Guru Hargobind, gave one of their sons to Baba Sri Chand’s yogi lineage, the Udasis. Of both, Guru Ramdas and Guru Arjun, the story is told that they went in disguise out in the streets to serve the pilgrims and wash their feet.